Richly equipped beer garden based on the Sternquell brewery in Plauen. With fence, two vendor booths, 4 large umbrellas, 14 tables and 28 benches as well as 4 lamps (non-functional). 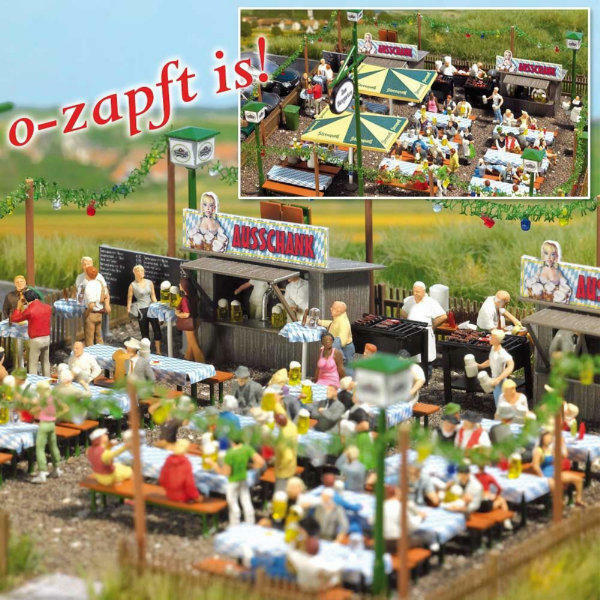 A large pole with advertising sign is included as well as many small details which will leave the visitor’s mouth watering: 2 grills for BBQing, a tap for the rapid supply of Beer as well as scale one-litre steins for the large beer thirst. Kit. Footprint area varies but is approx. 160 x 160 mm.